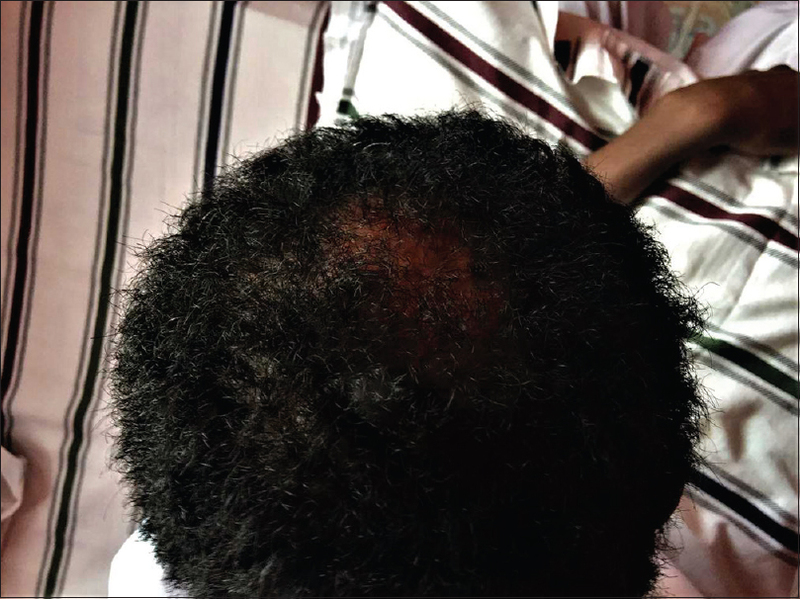 A 23-year-old male patient from Kenya was presented with foul-smelling lesion on the scalp for 5 years. He complained that when he was on treatment, his lesions would get better; however, they recurred within a week after stopping the treatment and it was painful. A skin biopsy was done for him in Kenya and his condition was confirmed as folliculitis decalvans (FD). His medical history revealed that isotretinoin therapy (up to 60 mg/day for 3 months) had been given when he was in Kenya. However, the lesions would reappear within a week of stopping isotretinoin. The patient had a boggy scalp with oozing, scabbing, and folliculitis at the time of presentation to the hospital [Figure 1]. Laboratory tests (complete blood count, liver function test, and lipid profile) were found to be normal. Culture examination of the pus from his lesions was positive for clavulanic acid-sensitive staphylococcus. The patient was initiated on an empirical course of doxycycline 100 mg b.i.d and terbinafine 250 mg b.i.d for 2 weeks as well as topical clindamycin, fluocinolone, chymotrypsin, and paracetamol (for the pain). After completing the antibiotic course, he was given isotretinoin 20 mg/day for 3 weeks. We extended isotretinoin for 3 more weeks, but there was no more improvement in the lesions. Many pustules, sterile in nature, remained. In October 2017, with the free consent of the patient, we then shifted him to biologic therapy using biosimilar adalimumab (ZRC-3197, Cadila Healthcare Ltd., (Ahmedabad, Gujarat, India) an indigenously developed “fingerprint match” of Humira®) without any other oral medication. He was given 80 mg on week 0 and week 2 and then 40 mg on weeks 3, 4, 6, 8, 10, 12, 14, and 16. Thereafter, we tapered to 40 mg every 4 weeks from February 2018. Before the initiation of the biosimilar adalimumab, the patient was promptly screened for tuberculosis, hepatitis B and C, and human immune deficiency virus infections and found negative. He has been maintained on povidone-iodine shampoo. The patient was able to wean off from isotretinoin and stopped it by 2 weeks after the initiation of biosimilar adalimumab. At present, the patient is only on monthly biosimilar adalimumab [Figure 2]. 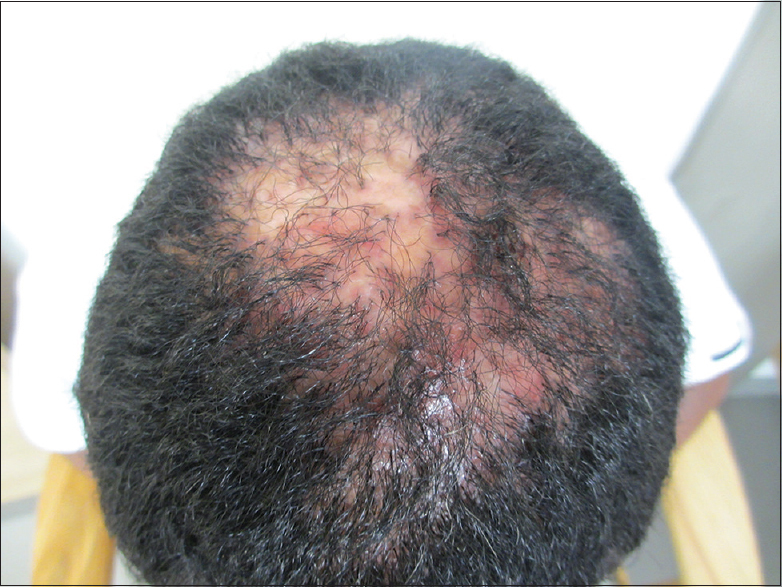 No recurrence in lesions and pustules in his scalp was observed and the patient is extremely happy as he never had complete remission from the scalp lesions over the last 5 years. To not to deny the possible benefits of treatment to any patient, with the free consent of this patient, we attempted to personalized treatment with biosimilar adalimumab for his condition of FD. To our belief, we attained positive results with biosimilar adalimumab therapy in line with earlier case report. No adverse reactions or new safety concerns were noted throughout the therapy. To confirm this observation, we assume that there is a need of larger number studies with longer duration of therapy. Bandyopadhyay S, Mahajan M, Mehta T, Singh AK, Parikh A, Gupta AK, et al. Physicochemical and functional characterization of a biosimilar adalimumab ZRC-3197. Biosimilars 2014;2015:1-18. Kreutzer K, Effendy I. Therapy-resistant folliculitis decalvans and lichen planopilaris successfully treated with adalimumab. J Dtsch Dermatol Ges 2014;12:74-6.